Carissa – Bursaries is money given to a person by a group to help out with paying for post secondary (… usually). It’s not the same as a scholarship as it’s not just academic based. It’s usually needs based, but has the same sort of restrictions as some scholarships have. Like in terms of what kind of degree you’re working on, if your family is below the poverty line, if your mom raised you all by herself. That sort of thing. Work’s been kind of painful today. The actual work portion of it, attempting to decipher people’s writing. Because, you know, it’s incredibly difficult to do 4’s and 9’s differently. Same with 6’s and 0’s, 1’s and 7’s. Which makes it rather difficult when you’re trying to enter data into something that is going to be used by other people. My supervisor/boss-type-figure got a promotion (well, it was announced today). First order of business? B: Oh, by the way Michelle, next week you’ll be moving over to Building B. B: Permanently? Until you go back to school. I’m moving!!! -tear- Not cool. He told me back in… May that there was a ‘possibility’ that I will be moved to the other building. But in June he said that it seemed unlikely. And now it’s… “Oh, by the way…” Cheers. Anyways… I have nothing else, really, to say beyond complaining about having to move (a month before I leave too! )… So I hope you all had a wonderful Thursday, and I thought I’d leave off with a photo of work stuff (because I’m just that boring, haha). I tried to take photos of gummy bears doing inappropriate things during part of my lunch break, but my camera just wouldn’t focus on the candy well (… probably because there’s a nicely detailed fake woodgrain background). So you get a photo of part of my desk instead. It’s actually relatively clean than it normaly use. And, by the way, that coffee cup does not hold coffee. It’s my non-coffee coffee-cup. It held tea this morning. I hope the move isn’t too annoying. I have a bit of the same problem at work, trying to read the children’s 6’s and 0’s. I used to write my nines so they had a curly tail rather than a straight one (if you know what I mean); it was a bit difficult to get the hang of while keeping it neat at the same time. 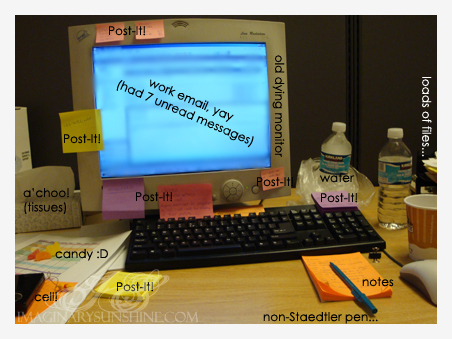 Wow, lotsa post-its. What a clown of a boss. “Oh by the way, you’re moving.” >_< Good luck with that. I just don't understand why he'd make you do it when you're leaving in a month. Aw, now I want to see the gummy bear pics, lol. Aw I’m sorry you have to move. I hope it all goes smoothly at least!! Your desk is super cute!